Sunday Suppers was graciously asked to guest blog for Martha Stewart’s wedding blog : The Bride’s Guide with Darcy Miller. 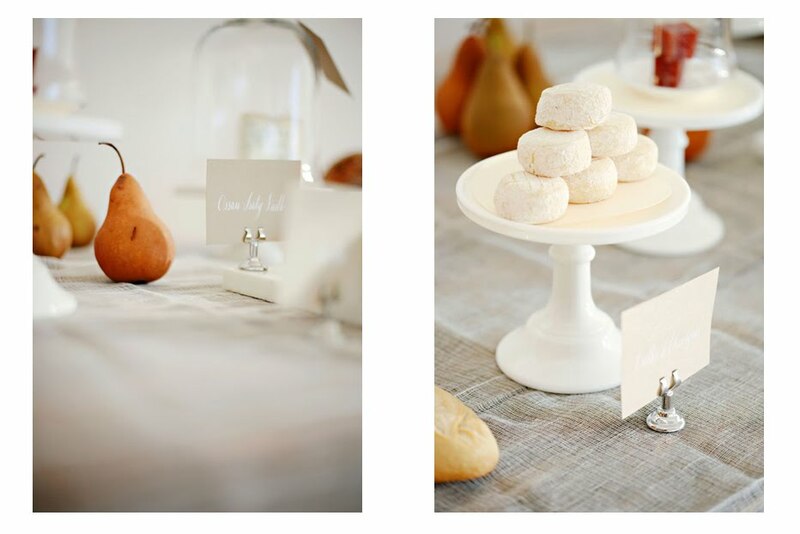 For our post we decided to create a dessert cheese table—very much in the French fashion—using a rustic chic look for d?cor, staying within the given color palate of cream and white. Cheese, in its blocks and wheels, is such a beautiful thing. We also love this because it is very attainable for every bride—DIY brides to high end wedding planner events can mold this idea to fit their budget. We sought out cheese that created visual variety for the display, and variety in taste for the serving. We also searched for pairings that really highlighted and complimented their cheese. Once our cheeses were selected (more on that later) we had a great time arranging a beautiful buffet table. We used delicate pairings like french baguette, honey, and pear, to add colors and shapes. We also enlisted the incredibly talented Maybelle Imasa-stukuls to create signage for our cheeses. These beautiful French names and gorgeous wheels deserved nothing but the best for their labeling.